One of the biggest staffing problems that call centers face today is staff turnover. Finding and then retaining qualified staff has a huge impact on the bottom line as well as to quality of service. 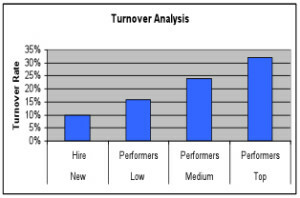 several different ways to calculate turnover rate. Turnover is at an all-time high in today’s workplace, and some of the overall turnover statistics have significant implications in the call center. According to the United States Bureau of Labor Statistics, workers aged 20-24 stay with an organization only 1.1 years on average (compared to 1.5 years just 15 years ago), and workers aged 25-34 stay 2.7 years (compared to over 3 years in the 1980s). Compared to these longevity numbers, call center workers who generally fall into this age group (ages 20-34) stay only about one year. Research studies indicate that the rate of turnover varies by area of the country, employment factors in a specific region or city, and by industry. There is a much higher turnover rate in routine, order-taking positions or in outbound telemarketing where burnout is high. Turnover is lower in more specialized, higher level jobs and also lower in union environments. Overall averages for the call center industry as a whole range between 30–45 percent, with some centers having almost no turnover, and other centers having turnover in the triple digits. You should calculate the turnover rate for your center on a regular basis and in many different forms. You’ll want this number for trending purposes and business case justification for programs to assist with retention. numbers in the table below, the turnover rate would be calculated by dividing 54 (the number of departing staff) divided by the average number of staff positions (81.5), resulting in an annual turnover rate of 66 percent. This simple calculation gives you a good starting point, but isn’t all that useful by itself. You’ll want to take a look at your turnover rate in many different ways. Here are some of the variations that will be interesting and perhaps more actionable than just the overall turnover rate. Internal turnover refers to employees leaving for other positions within the company, while external turnover shows employees leaving the organization completely. Both are costly to the call center organization, but obviously some benefit exists to the organization if qualified people are leaving to fill other roles within the company. The key is to track the exit rate from the center into other positions and build this into your staffing and training plan. One large financial organization has a high percentage of loss to other departments, with the call center seen as an easy entry point to the company from which one can springboard to other positions. Rather than bemoaning this fact, they’ve tracked and documented the exodus and gotten extra budget dollars for staffing and training programs for preparing staff for taking other positions in the company. Turnover should also be analyzed to understand the proportion of agents who make the decision to leave the company compared to those that are being terminated. If your company has to terminate significant numbers of employees due to poor performance, there may be a problem at the recruiting and hiring phase. The company may be hiring too quickly just to fill seats and may not be screening carefully enough for necessary knowledge and skills or evaluating the personality match with the work environment. Exit interviews should examine those reasons that are unavoidable, such as someone returning to school full-time or relocating for a spouse’s job. These exit interviews can shed light on what reasons are unavoidable and what reasons could have been addressed by the call center. Turnover rates should be calculated for the center, but should also be calculated for smaller defined groups. 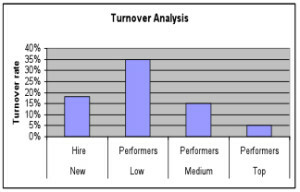 For example, turnover should be examined by team or supervisor. Calculating turnover rate by team may help pinpoint problems where employees are leaving due to supervisory issues and not because of compensation, job fit, or other factors. Those supervisors or team managers with consistently high retention rates can perhaps serve as “retention models” for other supervisors who can learn from their motivation and management techniques. You should also review the turnover statistics to see if there is any correlation with the skill or type of calls being handled. Calculation by call type in one organization revealed nearly double the turnover rate for one particular type of call versus any other one due to its difficulty and higher stress levels. When that center was able to allocate more resources to that call handling group and alter performance expectations slightly to make it a less stressful environment, retention improved significantly. It should be noted that while turnover almost always has a negative effect on the call center, there are some positive aspects. If you are losing personnel that were not performing well, the opportunity to hire replacements can be a positive experience. Bringing in new personnel provides an opportunity to gain new ideas and to obtain some fresh perspectives. over 30%, while only 15% of the poor performers are going out the door. On the other hand, the next table represents a turnover situation that might not be viewed as negatively. In this example, the center is doing a good job of keeping good people, with only 5% of the top performers leaving. Turnover rate is high for the poor performers at 35%, but if you’re going to lose staff, it’s better to have the nonperformers leaving. You should be taking a close look at your turnover numbers if you hope to manage it better. We’ve explored several possibilities here for how to look at turnover rate. Now let’s take a look at the other important calculation of turnover costs. According to the Human Resource Institute, turnover costs about $10-$15k to replace a frontline employee. An Insightlink Communications study showed that turnover costs were in the 25–30% range of a full salary and benefits package. Let’s take a look now at some of the ways that turnover costs might be calculated in the call center. These costs can be separated into the more obvious hard costs of turnover, but there are many additional, harder-to-quantify soft costs that should not be ignored. Some of the hard costs fall into the recruitment and hiring category. When replacing staff, the cost of advertising can be high. Some of these costs are for advertising, job fair participation, and all the time current personnel spend in screening and interviewing. well as the costs for the trainers’ time. Finally, there are additional costs once the employee actually gets on the phone with additional supervisory time needed. There can also be additional overtime costs during the period of time when new staff are being prepared for the work and existing staff have to be used to cover the workload. The table below gives one possible breakdown of turnover costs. In the example below, it cost over $6,000 to replace a person making $12 per hour. This is over $128,000 per year for 20 people. Also, you have to consider the lower morale when there are not enough staff to go around. The ones in place will be overworked and morale and service may suffer as a result. Productivity levels are likely to fall off as morale goes down. of staff finding new work with their newly acquired knowledge and experience. One of the first steps in developing an overall retention strategy is to fully understand the current numbers. Breaking down and analyzing turnover rates in various ways can give you a better understanding of why the staff are leaving. And analyzing costs can perhaps help you cost-justify processes and programs to help retain valued employees. Once you have settled on the numbers, the next step is to develop a retention strategy. We will explore some retention strategies focused at the supervisory level in the next issue of The Connection. Penny Reynolds, co-Founder of The Call Center School, is a frequent contributor to QATC publications and programs. She can be reached at pennyreynolds00@gmail.com or at 615-812-8410.